The B vitamins or vitamin B complex are a group of eight, chemically distinct, water-soluble vitamins that were once considered a single vitamin (like Vitamin C), but now are seen as a complex of vitamins that have loosely similar properties and generally are found in the same foods. Vitamins are organic (carbon-containing) nutrients obtained through the diet and essential in small amounts for normal metabolic reactions in humans. The B vitamins play important roles in cell metabolism. Although the B vitamins are needed in only small amounts, they are essential for health and must regularly be replenished. Without the intake of these vitamins, one can experience various diseases (such as beriberi and pellagra) or other stresses on one's body, such as anemia, depression, memory loss, and so forth. For good health, personal responsibility for one's nutrition and self-discipline and balance in one's eating habits are vital. The B vitamins include thiamine, riboflaven, niacin, pantothenic acid, pyridoxine, biotin, folic acid, and cobalamin. These are also referred to by a number, such as Vitamin B1 for thiamine and Vitamin B2 for riboflavin. In contradistinction to the definition given above for vitamin, some authorities include choline, inositol, PABA (para-aminobenzoic acid), and lipoic acid as part of the B vitamins (Longe 2005). However, these four unnumbered nutrients are not essential because they can be synthesized by the human body. The numbers that do not appear in the sequence, Vitamin B4, Vitamin B8, and so forth, were nutrients that were either found to be duplicate substances or non-vitamins (see related nutrients). Promote cell growth and division—including that of the red blood cells that help prevent anemia. All B vitamins are water soluble, and are dispersed throughout the body. They must be replenished daily with any excess excreted in the urine. B vitamins come from a number of natural sources, including potatoes, bananas, lentils, chili peppers, tempeh, liver, turkey, and tuna. Nutritional yeast (or brewer's yeast) is an especially good source. The Australian spread Vegemite is considered a rich source of the B vitamins. As might be expected, due to its high content of brewer's yeast, beer is a reasonable source of B vitamins (Glaser 2002), although this may not be true of filtered beers (Harden and Zylva 1924). Another popular means of increasing one's intake of the B vitamins is through the use of dietary supplements. B vitamins are also commonly added to energy drinks. Several named vitamin deficiency diseases may result from the lack of sufficient B vitamins. Vitamin B1 – Thiamine deficiency causes beriberi. Symptoms of this disease of the nervous system include weight loss, emotional disturbances, Wernicke's encephalopathy (impaired sensory perception), weakness and pain in the limbs, periods of irregular heartbeat, and edema (swelling of bodily tissues). Heart failure and death may occur in advanced cases. Chronic thiamine deficiency can also cause Korsakoff's syndrome, an irreversible psychosis characterized by amnesia and confabulation. Vitamin B2 – Riboflavin deficiency causes ariboflavinosis. Symptoms may include cheilosis (cracks in the lips), high sensitivity to sunlight, angular cheilitis, glossitis (inflammation of the tongue), seborrheic dermatitis, or pseudo-syphilis (particularly affecting the scrotum or labia majora and the mouth), pharyngitis, hyperemia, and edema of the pharyngeal and oral mucosa. Vitamin B3 – Niacin deficiency, along with a deficiency of tryptophan causes pellagra. Symptoms include aggression, dermatitis, insomnia, weakness, mental confusion, and diarrhea. In advanced cases, pellagra may lead to dementia and death. Vitamin B5 – Pantothenic acid deficiency can result in acne and paresthesia, although it is uncommon. Vitamin B6 – Pyridoxine deficiency may lead to anemia, depression, dermatitis, high blood pressure (hypertension), water retention, and elevated levels of homocysteine. Vitamin B7 – Biotin deficiency does not typically cause symptoms in adults but may lead to impaired growth and neurological disorders in infants. Vitamin B9 – Folic acid deficiency results in elevated levels of homocysteine. Deficiency in pregnant women can lead to birth defects. Supplementation is often recommended during pregnancy. Researchers have shown that folic acid might also slow the insidious effects of age on the brain. Vitamin B12 – Cobalamin deficiency causes pernicious anemia, memory loss, and other cognitive decline. It is most likely to occur among elderly people as absorption through the gut declines with age. In extreme (fortunately rare) cases, paralysis can result. Many of the following substances have been referred to as vitamins because they were believed to be vitamins at one time. They are relevant to vitamin nomenclature in that the numbers that were assigned to them form "gaps" in the series of B-vitamin names (along with duplicate factors). While they are non-"essential" to humans in that they may be synthesized by the body from other starting materials, they have nutritional significance. Some of them, though not essential to humans, are essential to other organisms. Vitamin B7: A factor that Centanni claimed in 1935 to have extracted from rice polishing using alcohol (SHL 2007). A water and alcohol soluble rice-bran factor that prevents digestive disturbance in pigeons. Possible candidates for this substance are inositol, nicotinic acid(niacin), and biotin. Vitamin B11: Pteryl-hepta-glutamic acid—Chick growth factor, which is a form of folic acid. Vitamin B14: Cell proliferant, anti-anemia, rat growth, and antitumor pterin phosphate named by Earl R. Norris (biochemist of folic acid fame). 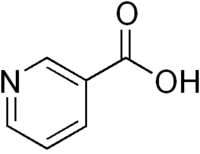 Vitamin B16 (Dimethylgycine)—also known as DMG. Vitamin B17 (Amygdalin)—proponents claim this is effective in cancer treatment and prevention and is commonly found in apricot kernels. Vitamin B22 Factor often claimed as an ingredient of aloe vera extracts but also in many other foods. Vitamin Bh Another name for biotin. Vitamin Bm Used to designate inositol and also called "mouse factor." Vitamin Bv A type of B6, but not pyridoxine. Vitamin Bw A type of biotin, but not d-biotin. Vitamin Bx Another name for PABA (para-aminobenzoic acid). Note: B16, B17, B18, B19, B20, B21 & B22 do not appear to be animal factors, but are claimed by naturopaths as human therapedic factors. Glaser, G. You're better off with beer: Beer and your health All About Beer Magazine 23(3), 2002. Retrieved August 5, 2007. Harden, A., and S. S. Zylva. Investigation of barley, malt and beer for Vitamins B and C. Lister Institute, 1924. Retrieved August 5, 2007. Longe, J. L. (Ed.). The Gale Encyclopedia of Alternative Medicine. Detroit: Thomson/Gale, 2005. Soil and Health Library (SHL). Vitamins, Chapter 4. Soil and Health Library, 2007. Retrieved August 5, 2007. This page was last modified on 23 January 2016, at 16:14.